Researchers from the University of Southampton are to develop software that can monitor the equipment, fuel and energy performance of a ship at sea. The University is part of the Ship Energy Assessment – Condition Optimisation & Routing Enhancement System (SEA-CORES) consortium, which provides a live model of ship performance on global operations. The development of the software is led by BAE Systems and is sponsored by Innovate UK. SEA-CORES is able to correlate variables that could affect a ship’s performance, such as energy consumption and different weather conditions. Using genetic algorithms to track and capture the live data, SEA-CORES provides those on board with a greater understanding of the vessel’s capabilities across a wide range of operations. Researchers from Electronics and Computer Science at the University of Southampton will work on monitoring loads on the ship and applying novel machine learning techniques to a domain that has largely been data poor. BAE Systems is developing and testing SEA-CORES on a commercial tanker provided by James Fisher Marine Services. The trial will analyse the vibration and trim performance of the vessel, its hull state and monitor the integrity of the ship’s superstructure. Chris Courtaux, Head of Engineering and Energy Services at BAE Systems, said: “SEA-CORES is able to consider all of the important components which affect the performance of a vessel during deployment. 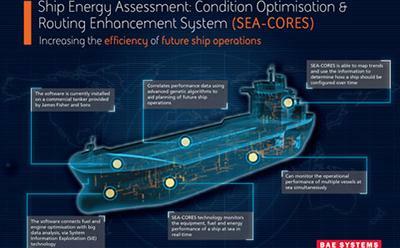 The software connects technologies in delivering fuel and engine optimisation through the use of the BAE Systems’ Ship Energy Assessment System (SEAS), together with big data analysis by using System Information Exploitation (SIE) technology. SEA-CORES has been developed in response to the increasing complexities of modern warships and the amount of data their systems produce. The technology could transform how the Royal Navy and BAE Systems maintain and support warships in the future by using the genetic algorithms to identify the relationships between a ship’s systems, calculate their different permutations and ultimately recommend a strategy to optimise the vessel’s performance.